Anatomic total shoulder arthroplasty is becoming a more commonly performed procedure in younger and older populations, with more than 50,000 people in the US having shoulder replacement annually. At ICJR’s 6th Annual Shoulder Course in Las Vegas last year, Mark A. Frankle, MD, from the Florida Orthopaedic Institute in Tampa, shared his surgical pearls for total shoulder arthroplasty, encompassing tips for preoperative planning and the surgical technique. 1. Start with the end in mind. A perfectly placed implant begins with a plan, Dr. Frankle said. He obtains humeral and glenoid radiographs to assess proximal humeral bone loss, anticipate the size of the stem and the humeral head, and evaluate glenoid version. CT scans allow him to assess the integrity of the rotator cuff, glenoid bone defects, and wear pattern of the glenoid. 2. Recognize and prepare for difficult cases. Dr. Frankle evaluates concentric and eccentric wear, including symmetric versus asymmetric distribution of joint space loss, bone erosion, sclerosis, and cystic formations, so that he’s prepared intraoperatively to do a reverse procedure if necessary. 3. Atraumatic dissection. Dr. Frankle starts the incision 5 cm medial to the acromioclavicular joint, using the scalpel to cut the skin only. To minimize bleeding, he uses a Bovie, coagulates the anterior circumflex artery, and gives tranexamic acid to all patients except those with a history of deep vein thrombosis or pulmonary embolism. 4. Develop all spaces. This includes the subdeltoid space, the subacromial space, and the subcoracoid space. Doing so allows Dr. Frankle to easily place retractors during the procedure. 5. Lesser tuberosity osteotomy. Dr. Frankle places a large blunt Hohmann retractor between the conjoined tendon and scapularis, then begins the osteotomy using a saggital saw. The osteotomy is finished with an osteotome. 6. Humeral head cut. Make the head cut flush with the rotator cuff. Dr. Frankle does the osteotomy in 30 retroversion with a 135 cutting guide to get as close to the rotator cuff as possible and maximize the head cut. 7. Handling osteophytes. All posterior osteophytes should be removed to allow for better glenoid exposure. The best way to access these osteophytes, Dr. Frankle said, is to place a bump under the patient’s elbow and slightly forward flex and externally rotate the patient’s arm. 8. Complete glenoid exposure is critical to appropriate component placement. Glenoid exposure is achieved by sequential retractor placement and systematic removal of capsulolabral tissue. Dr. Frankle starts by placing a large sharp Hohmann retractor posteriorly and another large sharp Hohmann anteriorly. He’ll perform an anterior capsulolabral release and then an inferior capsule release. A Cobra retractor is substituted for the anteriorly placed Hohman retractor. A small sharp Hohmann is placed superiorly and the superior labrum and biceps stump are released as the final step in obtaining full glenoid exposure. 9. Soft tissue balance is paramount. When trialing the components, the shoulder should move well, with good mobility, and the osteotomy should lay in the repair site with minimal tension. 10. Certain characteristics make total shoulder arthroplasty more difficult, including a biconcave glenoid, severe bone loss, severe retroversion, and significant soft tissue imbalance. So be prepared: Have reverse shoulder implants available in the operating room if an anatomic total shoulder turns out not to be viable. 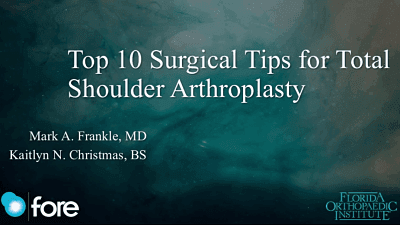 Click the image above to watch Dr. Frankle’s presentation and get more tips for total shoulder arthroplasty. Dr. Frankle has disclosed that he receives royalties and research from, is a paid consultant for, and is on the speakers’ bureau of DJO Global.